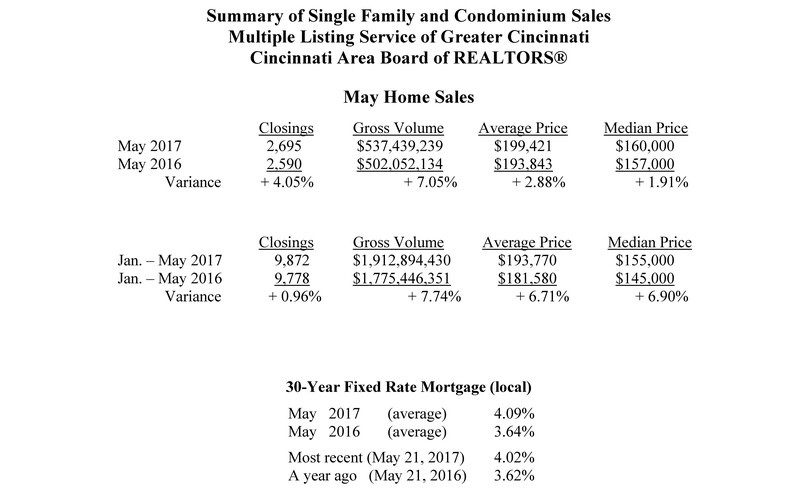 May home sales rebounded from last month to a record setting May, up + 4.05 % compared to May a year ago. Home sales this month were 2,695 compared to 2,590 in May 2016. “Home sales remain strong, powered by the continued low interest rates and the demand for affordable housing,” said David Welch, President of the Cincinnati Area Board of REALTORS®. “Locally, as well as nationwide, low inventory and low interest rates continue to propel the real estate markets, driving prices higher in this “seller’s” market,” said Welch. The average home price climbed to $199,421 compared to $193,843 a year earlier, a + 2.88 % increase. At the same time, the inventory of homes for sale, as of May 31, continued its year-over-year declining trend to 5,087 from 6,781 a year ago, down – 24.98 %. The average price of homes set a new record for the month of May, extending our consecutive record months of average home sale prices to twelve. “Even though our inventory numbers are down, do not become distressed over this decline. Consumers need to understand that the market is strong and property that is in “move-in” ready condition in the right neighborhood is selling quickly, sometimes with multiple offers. We have buyers that are ready to purchase the right home. Today, more than ever, we need those who are ready to or thinking about selling their home, to list with a Realtor,” said Welch. Local home mortgage rates in May averaged 4.09% for a 30-year fixed rate loan. The rates were up compared to 3.64% a year ago. At these fixed rates, the monthly principal and interest payment on a $100,000 home loan with no money down would be approximately $483. Nationwide, May home sales were up + 1.1 % from April on a seasonally adjusted basis and were up + 2.7 % from May 2016.